This book is bigger than I expected. It has 176 pages, and the size is about A3 size, similar to artbook GENGA - OTOMO KATSUHIRO ORIGINAL PICTURES which is also published by Pie Books. The two books would make a good set. 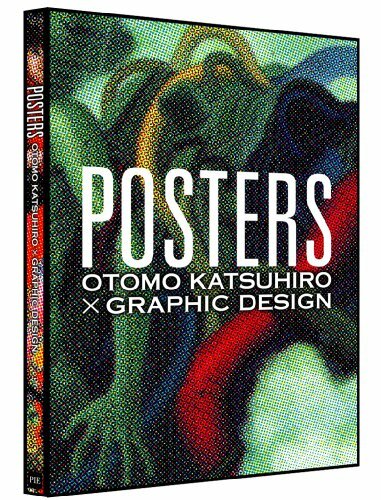 Besides creating comics and animated movies, Otomo Katsuhiro also designs many of the posters and graphics. This book consists of the work created for promotional purposes, display posters, books, advertisements, designs for video discs and packaging. There are over 50 pages of posters devoted to Akira. The artworks are created for the various different releases, from laser discs to DVD to Blu-ray, and for different publications and events. You'll see a mixture of Japanese and English posters. For anime, there are also works from Memories, Steamboy, Short Peace, Neo Tokyo (迷宮物語) aka Manie Manie, Roujin Z (老人Z), Robot Carnival, World Apartment Horror (a live-action film) and Mushishi (蟲師) (another live-action film). After anime, it's followed by the books section which has the graphics for his own publications as well as others. You'll see ビバ・イル・チクリッシモ! (VIVA IL CICLISSIMO! ), a book relating to biking, KABA, and many more. That's followed by the section for advertising artworks. Lastly, there's an interview with Otomo that talks about all his animated films and projects, and also an illuminating essay about all the promotional art featured in the book. The text is in both Japanese and English (PIE Books usually have two languages for their Japanese artbooks). There are a lot of works I've not seen before, but there are also some that have appeared in his other artbooks such as in KABA2. I would consider the artworks in other books to be the raw form, in POSTERS they are adapted to be used in posters and other promotional materials. Personally, I think it's still worth getting if you already have other Otomo artbooks. Here there are the posters for KABA and GENGA. A large Akira poster is included with the book.